January 19 – 21 saw 11 Sovereign Lake athletes and a couple of masters take to the Riverbend Golf Course for a weekend of intense cross-country ski competition at the Haywood Western Canadians in Red Deer, Alberta. Red Deer is preparing to host the Canada Winter Games in 2019 so this was a means to get some preparation in for their organizing committee and race crew. The weather was pretty decent for cross-country skiing but a lack of snow challenged the facility. They managed to rob snow from the golf course and pack and groom it into the short courses that created an exciting spectator venue for sprint and distance races. Day 1 saw Classic Sprints dominate the day. Paige Latta leading the start of a sprint heat with her famous power starts. All 11 racers Qualified to race in the heats which is a great accomplishment at this level of competition. Junior Girls started us off with a fast and technical 800M course. Clara Hardy, Hannah Stocker, and Madison Land qualified to the quarter heats but didn’t get past that round. Paige Latta won her first quarter heat and came second in her semi sending her to the A final. She took the early lead in the final heat but was boxed out in a tight corner and finished 5th overall. Ian Oliphant, Junior Boys 800M race was fast and exciting. He placed within the top two in all of his heats advancing him to the A Final where his textbook technique took him to a Gold medal. Ian Oliphant pushing hard on the left in his Team BC suit. Charlie Hiam, visiting from Australia, joined the SLNC crew and was thrilled to qualify in his first Western Canadians event. Torin Andrews and Lucas Sadesky also skied the 800M course in the Juvenile boys category both qualified but didn’t advance past their quarter heats. Midget Boys had a fast 300M course and Pedar Ree dominated every heat taking Gold. Parker Munroe just missed making it into the semis but was pleased with his efforts. Sierra Munroe placed 7th in the Min Midget Girls category for that day. Day 2 brought on Classic Distance competition. The Junior Girls and Boys took 3 laps of a 3.3km course creating a 10km distance. Paige Latta just missed the podium and took 4th. Clara Hardy, Hannah Stocker and Madison Land had strong performances keeping them in the middle of the pack. Ian Oliphant was leading the race but took a bit of a stumble in his third lap and wound up 7th. Charlie Hiam was near the end of the pack but was happy to not be the last racer into the stadium. Juvenile Boys had a 5km race with two laps of a 2.5km course. Torin Andrews took Gold and Lucas Sadesky Silver for their efforts. Midget Boys also skied the same 5km distance and Pedar Ree and Parker Munroe had respectable placings in this large group. Sierra Munroe completed 3km and place 9th in the Mini Midget Girls. Parker Munroe skating into the stadium. Day 3 Split the Competitors into teams of 3 for a Skate Relay race. Athletes were grouped by province for a showdown of sorts. Junior Boys started the day with a 3×3.3km course and Ian Oliphant was on the BC Machine team. They took the Gold. 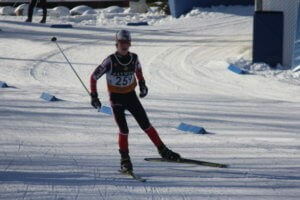 Charlie Hiam raced with a mixed group including a Juvenile skier and took 9th. Junior Girls had our 4 spread out. Paige Latta was placed on the BC Twisted Sisters team and anchored them to a Gold podium finish. Clara, Hannah, and Madison all did super work in supporting their teams. 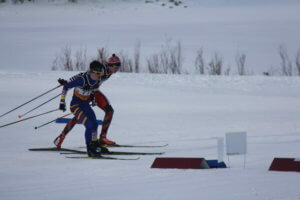 Juvenile Boys Lucas Sadesky and Torin Andrews teamed up with a third BC Athlete on Team Avalanche and took 4th. Midget Boys skied 3 x 3km and Pedar Ree’s Team Heavy Duty won Bronze. Parker Munroe raced up in the Juvenile category and had a great experience racing with the older skiers on a longer course. 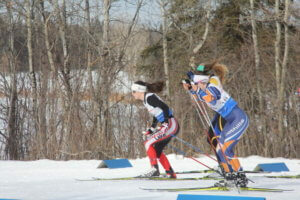 Sierra Munroe’s team of the BC Ice Pirates finished the day on a 3 x 3km ski placing 1st. Master skiers Paul Hardy and Chris Andrews skied a 10km course and both placed 6th in their age groups. Chris said it was a fun and fast ski. The next events for SLNC racing will be the Okanagan Cup in Kamloops Sunday, January 28th. Ian Oliphant and Paige Latta will be heading to Ottawa January 31st – February 4th for Eastern Canadians and some of the JD athletes will travel to Prince George for BC Cup#2.